Our office is located three blocks south of Henry Watterson Expressway on Dixie Highway. We’re directly across the street from McDonald’s. 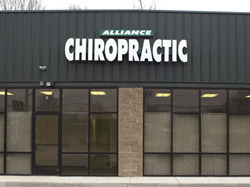 You’ll see a big red sign outside that says Alliance Chiropractic. We’re in a small shopping strip that has ample parking available to you. A public bus stop is right in front of our office.